DO YOU remember when metrics were all about hard data? You looked at spreadsheets that contained inbound searches, conversions, and other numbers, then used those numbers to determine how well your campaign was performing. That wasn’t a lot of fun, but at the time, it was effective. 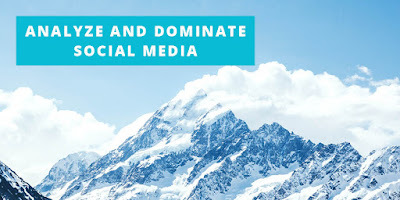 Luckily, social media has managed to move metrics beyond hard data. You already know that you need to pay attention to “Likes,” referral traffic, and other common social media metrics. What you may not realize is that there are other important metrics that brands often forget about. These metrics go beyond “Likes” – they let you see what is really going on with your customer base and stay on top of your social media presence. Now you have the opportunity to gauge how people feel about you – allowing you to see the people behind the numbers. Brand sentiment is one of the best ways to find out what Joe, Sue, and the gang have to say. First, though, let’s take a closer look at this metric. Brand sentiment refers to the emotion that people display when they mention your brand. Most people are emotional on social media, so with brand sentiment, you can measure happiness, annoyance, excitement, anger and more to get a better idea of how people view your company. In fact, studies have shown that messages online could influence emotions offline, allowing you to really tap into a positive emotional state and link that – in a productive way – to your brand. This emotional aspect goes beyond simply looking at mentions, and gives you insight into how people truly feel when they interact with you, or are exposed to your content on social media. As much as you may want to make your least favorite employee measure every social media mention, there is a better way to assess brand sentiment. Social Mention is one of the best tools out there. Type the name of your brand into the site’s search bar and you will get sentiment statistics across various networks. You will see the number of positive, neutral, and negative mentions and get a sentiment ratio. Hootsuite Insights is another great option. You can get a report for overall sentiment and then break it down by location, gender, and language. That way, you can determine whether your sentiment is solid across the board or if you have weak spots that you need to address. You’ll need to gauge your brand sentiment on a daily basis, checking for any positive or negative changes. If you notice a drop in sentiment, you should determine what caused the decline. A drop may have to do with something in your industry, or it may be brand specific. Either way, you need to address the problem so your brand sentiment doesn’t continue to slide. This is obviously going to take some trial and error, but if you catch the issue quickly by monitoring your results, you’ll be in much better shape. Plus, once you get the hang of it and start taking the right action to get things back on track – your public perception will be back on the upswing. Let’s face it – Brand Sentiment is really like a popularity contest, and you always want to come in first! Brand sentiment is just one piece of the puzzle. Put another piece in by measuring your customer response rates. According to a social media industry report by Sprout Social, 43 percent of the messages people send to brands on social networks require a response. That is a huge increase from the 15 percent that required a response in Quarter 3 of 2013. Unfortunately, a lot of brands haven’t made the adjustment to this change. They either don’t check their social media inboxes on a regular basis, or check them but treat the platform the same way they treat email. They will get to it when they get to it. It might be a day, or it might be a week. If you find yourself getting lazy about responses, it could cost you some customers. While you might want to wait until tomorrow, it’s a good idea to take action today. If you fail to message people back in the timeframe they want, you can expect to experience a fall out. Sixty percent of people say they dish out some type of negative consequence when they don’t receive a timely response, including telling their friends and family, escalating the concern, or buying less from the company in the future. So, without adequate follow up, you could be setting yourself up for a negative – and public – response from over HALF of the customers who reach out to you! Let’s look at how to avoid that, shall we? Use an analytics tool like Sprout Social to track response rates and streamline replies. Once you have your rates in hand, work on improving them to really optimize your customer relations. Need some hard quantifiers to get started? Aim to keep your response rate within an hour or two to really maintain customer happiness. According to Search Engine Watch, 65 percent of Twitter users expect a response within two hours when they send a message to a brand. The percentage goes up when people send complaints to brands. In fact, 72 percent of people expect the brand to message them back within an hour when they submit a complaint. You can always get faster, whether you need to hire a team dedicated to responding to messages or provide around-the-clock service. So far, you have looked at metrics that focus on your brand. Now, it’s time to switch gears and look at a metric that focuses on your competitors. You need to see how you stack up against the competition, which is why the share of voice metric is critical. Share of voice (SOV) refers to the number of mentions your brand receives when compared to the number of mentions that your competition receives. For example, if brands within your industry receive 100 mentions, and you end up with 50 of those mentions, your SOV is 50 percent. That is fantastic and really shows the influence of your brand within your target group AND niche. On the other hand, if you only have 5 mentions, your share is at 5 percent. That means you need to roll up your sleeves and get to work to improve it. Share of voice is about more than just dominating the conversation. It can also help you increase your market share. According to the Nielsen Company, if your share of voice is larger than your share of market, your market share will grow. The research company states that if your SOV is 10 points higher than your share of the market, your market share will grow half a percent. The percentage continues to go up as your SOV increases. Analytics programs make measuring your share of voice a snap. You can compare keywords to see which brand is dominating the market. You just need to run a report comparing the keywords to determine how you fare against the competition. 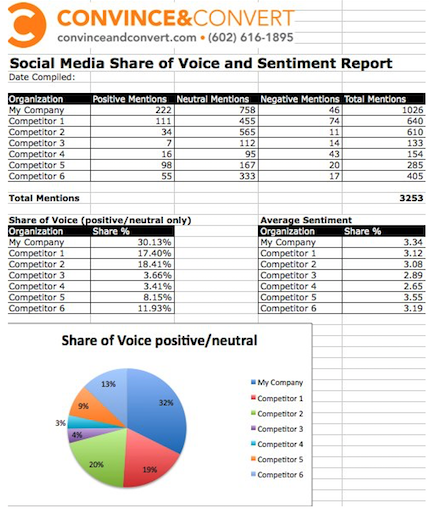 For some quick tips on breaking down your own personal results, be sure you have a Social Mention search ready to go, and then take a look at this quick article on creating a Share of Voice Report by Convince & Convert. This quick analysis will really help you know where you stand. This is a great – and useful – way of leveling the playing field, simply by being in-the-know. Does your competition have consistently active viewers due to really engaging posts? Is their content upbeat and positive, increasing their brand sentiment? Do they reply quickly to customer mentions, which results in a great customer response rate? See how quickly each of these killer metrics become interwoven, and how they are all so important? When it come to analytics, a lot of the most important metrics get ignored. But, being aware of the impact certain stats can have – and how they influence each other – may really help you hone in on the best marketing plan for your social media efforts. Brand sentiment, response rate and share of voice can each provide a snapshot of how your strategy resonates with your viewers. All together, they become a powerful assessment of your overall performance and reputation on social media. Get started now: add these analytics to your marketing strategy so you can improve your customer experience and your bottom line. While you’re at it, take a quick look at these ways to boost your social media efficiency and really up your social media game!